As soon as I saw the cover art for Vietnam Black by Brad Harmer-Barnes, I knew two things: firstly, that the distinctive nature of the illustration meant that the book was published by Severed Press, and secondly that here was a title that spoke to me on an almost primal level, somehow appealing to everything I could ever want in a piece of ‘creature feature’ fiction. Once again, as with so many titles, the importance of the quality and composition of cover art is key here, because it’s that cover art that instantly attracted to Vietnam Black and directly led to me downloading it to read. The title itself is strong and simple, clearly referencing the name of some sort of creature and also highlighting the period that the title is set in, but the content and composition of that cover can only be described as flawless in execution. I don’t usually go into this much depth in regards to cover art, despite my emphasis on their importance, but I think this deserves additional analysis. Styled to look like a movie poster, it’s dominated by the gigantic centipede-like creature that rears up in the centre of the cover, partially-eclipsed and thrown into shadow by the sun sinking below the horizon; a flight of iconic Huey-Bell helicopters flank the creature, simultaneously cementing the time period in the mind of the reader, and dramatically highlighting the sheer scale of the creature. At the very top of the cover we are provided with a cinematic tag-line, ‘This was the end’ – itself surely referencing that classic Vietnam-era song, The End, by The Doors – and the font for the title itself is styled to look exactly like the font for Apocalypse Now, providing another visual clue for the reader in terms of the theme for the title. I’ve always been impressed by the cover art provided by Severed Press for their titles, because they always make clever use of fonts, composition and a selection of stock images to create memorable images, but here their illustrator has outdone themselves, creating something that I think deserves to be held up as an exemplar for cover art design – something that is clear, engaging and visually distinctive. It’s an impressive start to Vietnam Black, and fortunately it’s matched by the writing quality of the title itself. The basic plot that makes up the novella is relatively straight forward – in the middle of the Vietnam war, a squad of GIs are given the task of trekking through a particularly dangerous section of jungle to locate a valued intelligence source – a local villager equipped with a radio, reporting on the movement of the Vietcong and North Vietnamese Army units in the area – who stopped making contact several weeks prior. It rapidly becomes clear, however, that what began as a simple search and rescue mission for the squad will turn out to be anything but, as there proves to be something far more deadly than the Vietcong haunting the jungle. Although it’s a well-worn trope, Harmer-Barnes has more than enough skill as a writer to make it interesting, and judges the pace well – rarely do more than a few pages go by without some kind of action scene or discovery to imperil the soldiers; the action scenes are well-written and thoroughly enjoyable, and the tension is expertly ramped up as more and more things to wrong. Harmer-Barnes’ descriptions of the jungle are particularly vivid, certainly reflecting a degree of research that not all authors always undertake for their works, and help to draw you into the narrative as it progresses. The characters in the squad are also well fleshed-out, especially when the relatively short length of the novella is considered. Although they’re all stereotypical characters – the grizzled Sergeant, only a few weeks from rotating home, the veteran Corporal hoping to be promoted, the nervous new recruit and so forth, the author imbues them with enough character and personality quirks to ensure that you actually care about them a little, even if the requirements of the genre mean that the reader knows that the majority of them won’t survive to the end of the story. Harmer-Barnes’ even manages to insert an interesting twist in terms of who the reader assumes the protagonist of the story to be, smoothly switching between the POV (point of view) character in the middle of the narrative. The star of the novel, however, is the titular Vietnam Black, the ‘creature’ part of the ‘creature feature’ genre. While at first I was mildly dubious that a centipede-type creature could be particularly fearsome, even with its size increased, the author rapidly disabused me of that –particular notion. Vietnam Black might be one of the most terrifying and disconcerting creatures I’ve ever met – both in the genre and in any other book that I’ve read. The first encounter between the creature and the soldiers is genuinely chilling, taking place in the cramped, pitch-black and deeply claustrophobic Vietcong tunnel system, soldiers hunting it armed with nothing but pistols and flashlights. Harmer-Barnes’ descriptions of the creature are spot-on and even a little bit unsettling, the creature snaking around and crushing its victims to death in an instant before feeding on them; the author clearly has a fantastic imagination, and I look forward to seeing what other creatures he can come up with in other titles. 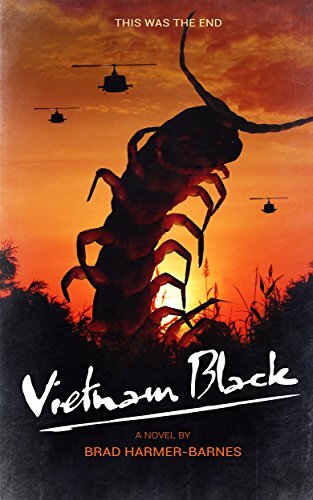 Vietnam Black might be one of the best examples of the ‘creature feature’ genre that I’ve ever encountered, and certainly one of the best titles ever published by Severed Press – in fact, I’d put them up there with the S-Squad novels by William Meikle, also from the same publisher. A brilliantly evocative cover, a simple but engrossing plot that draws the reader in, characters that are deftly written to actually make them interesting to the reader, and an antagonistic creature that is genuinely terrifying, all come together to make an excellent, first-rate novella. I look forward to reading the other titles in Mr Harmer-Barnes’ back catalogue; and whatever he writes in the future, I’ll be reading as soon as they’re published.